Girl hears some suspicious noises all around her, and, because the writers have seen horror films, she thinks it’s her boyfriend playing a prank. She runs up the path, following the direction Adam had headed in, only to stop suddenly as she stumbles across something horrifying – Adam has been murdered! There’s your twist, people! Doesn’t seem like the best choice for running around in the woods, do they? Did he polish them after the murder and before the girl ran up? Some time later the coroner’s men are wheeling the boy’s body away, and the girl is nowhere to be found. A few cops converse, revealing that Adam was some sort of local quarterback. 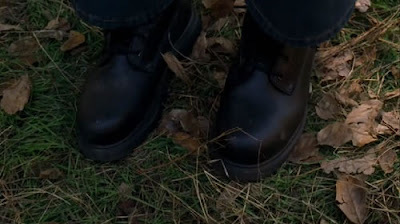 A more horrifying discover occurs a moment later, when the cops discover… a set of bones out in the woods with a fractured skull – just like Adam’s injury. Things get even more terrifying when the Sheriff pushes a branch aside, uncovering, carved into a tree, a… pentagram! Over at the Behavioral Science Unit headquarters, Derek and Reed engage in a little bit of character-building banter. It seems that Reed has been having horrible nightmares about his job. Derek suggests checking in with Mandy. The team assembles and finds out about the Satan angle, then it’s off to Virginia in their sweet private jet! On the way, Greg mentions to the Blonde that they have to keep the details of the crime out of the press – Elle is confused, and Reed takes the opportunity to engage in one of the most awkward expository monologues I’ve seen in a while. He talks all about the imagined Satanism craze and the repressed-memory fiasco of the 80s, which is all well and good, but isn’t this all stuff that Elle should know? She’s over thirty and a trained FBI agent – not only should she have learned about this stuff during her education, but she actually lived through it back in the 80s! Mandy dismisses the idea that Satanism is involved – he announces that there’s never been a confirmed case of a satanic ritual killing in the United States. We cut to the crime scene, where the team learns all about the victim – that he was beloved and strong, and not the type of person you’d expect to find with his head bashed in. There’s a little fun note as Derek refers to the killer as the ‘UnSub’, which the deputy needs to ask the meaning of. Greg explains that it’s a contraction of ‘Unidentified Subject’, then clarifies, and says he means ‘the killer’. Interchanges like this are supposed to portray the team as experts who really know their stuff as opposed to the local rubes, but they tend to backfire. After all, what’s really affected, improved, or assisted by having your own cute little terms for commonplace ideas? The only purpose it serves is to create a insular culture of elitism. For an example of this, please consider all of Academia. Saying ‘killer’ takes the same amount of time as saying ‘Unsub’, and avoids the need for secondary explanations. Mandy asks the sheriff about the possibility of there being a cult working in the area, and the sheriff exclaims it’s an absolute impossibility. The pentagram next to the bones and pooled wax from candles paints a more compelling picture, however. At this point a blonde woman runs up and announces that her daughter ‘Cherish’ was out running with Adam when he was murdered, and now she’s missing! Back from commercial, the team wonders if the kidnapping makes a group of killers more or less likely. They arrive at no conclusions. It seems that the sheriff is preparing a search party, and the prospect of this excites Mandy. He believes that in cases like this the killer almost always tries to help so that they can mind the investigation. He sends the Blonde to convince the sheriff to ask for volunteers from the local community. 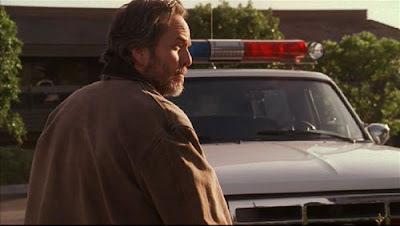 The blone and Reed accompany the sheriff back to his office to help arrange the search and make a few phone calls. On the way they run into a local pastor, who immediately agrees to assemble people for the search. Then, as the cops are walking away, the pastor turns and looks back at them in a meaningful manner as a musical sting plays. This awkward television shorthand would go a long way towards making the pastor seem like a suspicious character… if it weren’t for the next scene. Ah, the next scene. You know, there used to be a show called ‘the Pretender’ about a genius who took on a new personality each week to help solve crimes and right social injustice. The show was so incredibly formulaic that, in most episodes, you could tell who the killer was going to turn out to be based on the order the guest stars were introduced in the story. Jarod (that was the Pretender’s name) would first meet the victim of injustice (or a relative of the victim if the injustice was murder), second he would meet a suspicious authority figure, and third he would meet a friendly co-worker of the victim who seems to want to help. That third character would always turn out to be the villain. Well, okay, not always, the show went off-book now and again, but something like 80 percent of the time it followed that exact same formula. I mention this because not since The Pretender went off the air have I seen an episode of a television show where the killer’s identity was telegraphed so unbelievably obviously as in this episode of Criminal Minds. Yup, he’s the weedy son of the sheriff who’s telegraphing his uncomfortableness by clutching books to his chest. And the book on the outside? It’s got a picture of Nietzsche on it. You’re so the killer. If Reed were any kind of a cop at all he’d just slap his cuffs on the guy and everyone could go home early. But he’s not. Hell, the killer’s (from here on out, I’ll only ever be referring to this character as the killer) second line consists of him telling the complete stranger that he only plays football because his jock dad forced him into it. No, he enjoys more scholarly pursuits, like reading about how god is dead and morality is a lie. Reed and the killer bond over how ignorant the small-town people are, and how they couldn’t possibly understand Nietzsche even if they were literate enough to read it. Again, teen loves to tell you the lightning and the madness, then laughs about how much better he is than everyone else, and you don’t automatically suspect him? Time to turn in that badge, Reed. The sheriff tells his son to get the football team together, and we cut to all the volunteers assembling. The football team stands off to the side suspiciously, and one of the cheerleaders clearly knows something about the skeleton in the brush, the way she keeps peeking at the copse of trees. Of course Mandy doesn’t bother going over to talk to her, he just has the Blonde run background checks on the volunteers. In a last feeble attempt to create a red herring, it turns out the pastor has a criminal record. Also, one of the other volunteers has a criminal record for assault with a baseball bat. All of these attempts are just marking time, though, since the killer has already been so plainly introduced. Elle is off walking with one of the red herrings when she comes across a blood-splattered note pinned to a tree announcing that Cherish is going to be killed that very night! Back at the sheriff’s station, it’s time for the profiling scene! They announce that satanists love to kill animals and vandalize things, but they haven’t actually sacrificed anyone. The team goes over the standard cult thing – charismatic leader, alienated teens, heavy metal music… it’s all just a waste of time. The killer then pipes up, announcing that he knows a creepy goth who hangs around with high school kids. Somehow forgetting their own rule that the guy who comes forward offering to help is always the killer, they take the killer’s theory at face value and run off to arrest the goth. On the way out, Mandy notices the girl who was meaningfully staring at the place where the skeleton was located is across the street from the police station, watching them. Finally he thinks it’s worth going to have a conversation. There’s a raid on the goth house, but since this is all a red herring, it’s not actually important. Over at the church, Mandy finally talks to the girl who clearly wants to tell him something. This sequence is intercut with the interview of the goth leader, but wow, is that all pointless and dull. Girl with a secret asks Mandy if he thinks that god is vengeful and punishes people. Mandy responds that he read some essays by religious scholars after Hurricane Katrina, and that one of them said that New Orleans was being punished for being a wicked city. Uh, yeah… Mandy… about that. Thousands did die. What you meant there was ‘thousands more would have died’. The crazy thing is that this show was made just a few months after Katrina – you’d think the wound would be fresh enough that he wouldn’t risk groping at it in such an insensitive manner. But hey, I’m not the profiler. Somehow this speech convinces the girl to speak – she’s convinced that it’s her fault that Cherish is missing! After that cliffhanger, it’s over to the goth house for a little follow-up on the whole ‘nightmares’ subplot. Reed is angry because Derek told everyone about the bad dreams. Derek explains that the team has to know, and that it’s okay because everyone who works serial killing has terrible nightmares. Hey, isn’t that something that might have come up in the training process you go through before joining the BSU? Just a thought. Their conversation is interrupted when the killer drives up, demanding to know if they found Cherish. He tells them about an outbuilding where they might have been keeping her – they run off into the woods, and what do you know? There’s the body. So first off, he’s insinuated himself into the investigation, and now, when you’ve failed to find his victim, he led you to her. How is he still not the prime suspect? The girl in the church finally divulges her secret. The body in the woods was a hiker who fell off the trail a year ago, and all the cool kids had been watching him decompose over the past year. While that’s more than a little icky, it also completely clears the goth kids of any involvement in the murder, because the pentagrams and candles were a recent addition – the goth kids are being framed! Despite this revelation, the interview scene with the goth king just drags on and on. 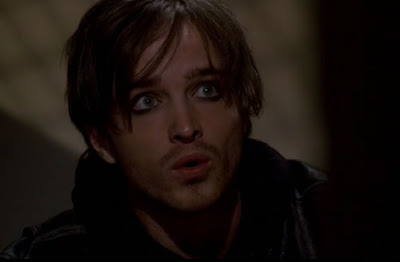 Hey, is he the guy from Breaking Bad under a lot of mascara? Back at the goth house, Derek sends Reed away so he can confront the killer. Finally someone figures it out. Of course, the fact that Reed didn’t get this much earlier really slaps his ‘genius’ cred down incredibly hard. They’re putting the pieces together at the office as well, and they all race out to the house after discovering that the killer swiped a gun. By the time they arrive Derek and Reed have already subdued the killer, wrapping up the episode in a fairly anticlimactic fashion. Of course, since the identity of the killer has been obvious for twenty minutes, it would be hard for a climax to build any real tension. On the plane ride home things get very crazy. And by crazy, I mean so full of misinformation and terrible logic it both insults the audience and serves to give them terrible ideas about profiling and the FBI. Trying to comfort Reed, Mandy pulls out a family snapshot. It seems the woman in the photo had been abducted when she was 13, and Mandy’s team back in the 80s had rescued her before the crazed killer did her in. Reed finally reveals the content of his dream – there’s a baby that he can’t get to in time before it’s murdered. No one has ever been rescued from a serial killer. Okay, that’s an exaggeration. But it’s not much of one. In the history of serial killings, a couple of victims have been rescued from serial killers, but not in the way the show is implying. There are a few cases of people being grabbed off the streets by a guy and having someone call the cops immediately, or bystanders on the street intervening, or something like that, leading to the freeing of the person, and sometimes the immediate capture of the criminal. But these cases are all interrupted abductions – criminals being caught in the act of trying to procure a victim. In all cases it was regular street police who caught them, and in most cases the police doing the catching weren’t even aware that a serial killer was working the area at the time an arrest was made. The closest thing to a rescue is Peter Sutcliffe, the Yorkshire Ripper, who’d been killing prostitutes for a while before he was caught. The police knew that someone was preying on prostitutes, so they started watching prostitute-infested areas and pulling over cars who picked them up. Sutcliffe picked up a prostitute and then freaked out when the cops tried to pull him over. In that one case you can kind of make the argument that the prostitute was rescued from the killer by cops who were specifically looking for that killer. It was still dumb luck, but it kind of counts. That’s not what the show’s talking about, though – nor every serial killer movie that’s ever been made. They like to spin fantasies about cops rushing into a killer’s lair to rescue the bound and helpless victim at the last possible moment – in addition to being kind of disgusting, these fantasies are incredibly inaccurate. Serial killers, as a general rule, abduct victims, take them to a second location, and then ply their evil craft away from prying eyes – it’s this practical necessity, the need to move to a second location, that causes prostitutes to be targeted so frequently. Many people try to ascribe some meaning to the way serial killers so frequently murder prostitutes, generally some claptrap about fallen women or madonna/whore complexes or repressed libidos striking out against public displays of sexuality, but that’s all drivel. It all boils down to simplicity. A prostitute is a woman who the killer doesn’t know who will get into the killer’s car and go somewhere with him. Killing a prostitute means the killer won’t have to go through the whole messy abduction part of the murder, and he can get right to that second location. Which is the key point I want to hit here. Once a victim reaches that second location, they will not be rescued. Full-stop, no wavering, no exceptions. There will be no one rushing in to save the day. To my knowledge it’s never happened in the history of North American serial killers. That’s not to say that there’s no hope for the victims. There are plenty of stories of captured victims escaping from the secondary location – most of those stories end with the killer being caught immediately afterwards. Of course, that being said, if there were cases of people escaping and then being recaptured, we wouldn’t know about it, because, you know, recaptured by a serial killer. Oh, except for the Dahmer thing where the guy escaped, got to the police, and then had the police turn him back over to his serial killer. We know about that one. The point I’m getting at here is that what Mandy says isn’t just bad information to give the audience, either – it’s a terrible way to console Reed. If you’re telling him that he can take comfort from the fact that even though they’re going to see a lot of dead bodies, they’ll save enough victims from just under the headsman’s axe to make it all worthwhile, then won’t he become so discouraged when that doesn’t happen that he’ll be driven out of the profession? Wouldn’t a far better tactic to take be to tell him that while they may not get to save the victims, they’re saving all of the future victims that the killer would have done in if he was allowed to continue killing? It seems like that would have a much better chance of cheering the guy up then a series of easily disproven lies. Only in the slightest. All of their profiling this week is centered around cults and the way they interact – since that has absolutely nothing to do with the actual killer, it’s just a waste of time and effort. Oh, yes. It just occurred to me that I never mentioned the killer’s motive. He had a crush on Cherish, and he thought the best way to get her was to murder Adam and frame the goth kids by killing him near the fake satanic shrine he’d created. For a kid that’s supposed to be a self-described genius, this was a terrible plan. First off there’s the old standby – if you want to frame someone, you need to have some kind of a certainty that they won’t have an alibi for the time of the murder. More importantly, your plan to kill the head jock involves staging the hiker’s corpse as a fake satanic scarifice to throw off the cops. Except all the other jocks can easily tell the cops that it wasn’t a satanic sacrifice, so the bashed-in skulls isn’t a pattern, but someone trying to create one. Even if he wasn’t the most obvious killer in the history of the show, he still would have been a terribly-written and unimpressive villain, one that the cops could have caught very easily. 2 – It’s hard to credit them with the profiling this time, since nearly anyone can repeat the observation that a killer will try to insinuate themselves into the investiagtion – simply doing so, or even watching for someone who wants to ‘help solve the crime’, barely falls under the category of psychology, especially when the killer goes to such ridiculous lengths to draw attention to himself. Let’s put it this way – if Gene Hunt ever used the method, it’s oficially no longer psychology, and has become a part of everyday policework. This was yet another episode of Criminal Minds where it looks like they're going to have to track down a really difficult kind of killer (like the bomber, or sniper), only for it to turn out to be a much more obvious and easily solvable kind of crime halfway through the episode. I wonder if the writers think this is clever - putting a twist in there. Because it reads like they just weren't good enough to write a whole story about the more interesting subject. If it’s at all possible, you should check out The Pretender. 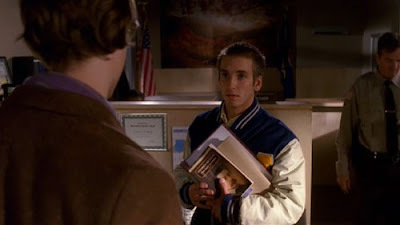 Especially because Sydney, Jarod’s teacher at the evil corporation where he was raised, was played by Patrick Buchau, owner of one of the greatest voices in all of acting. Oh, I looked it up, and King Goth was played by Aaron Paul from Breaking Bad. Good for him getting a steady job on a much better show (with a much worse title) than Criminal Minds. Lol, no wonder you never have any comment! You just love bashing the show!!!!! "Hey look there's this show I don't like. Instead of changing the channel I'm going to watch the entire show and write a scathing review on a no name blog. That will show them." Guess what EVERY show follows some kind of simple formula, just b/c your not smart enough to see them is your problem. Your horrible review and writing is ONLY overshadowed by the fact that you switch from using the characters' names in your descriptions to using the actors' names. Really? Even in writing a crappy blog you think you'd stick to a basic writing rule. Either write fully in the perspective of the characters in their TV world or write using the actors' name to identify who you're talking about. God this is awful. Jerry Falwell doesn't seem to have commented on Katrina. That seems to be from other folks like pastor John Hagee, former pastor/auxiliary bishop Gerhard Wagner, etc.